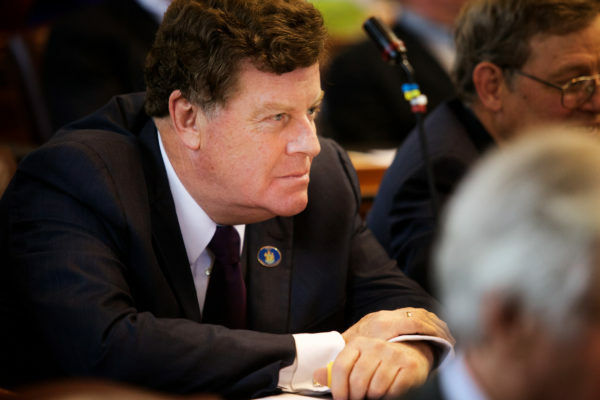 PORTLAND, Maine — Barry Hobbins, a longtime Democratic lawmaker and attorney, will serve as the state’s next advocate for utility ratepayers after a unanimous Senate confirmation vote. As public advocate, Hobbins will lead an office of attorneys and staff to represent low-income, residential and small business utility customers in cases that come before the Maine Public Utilities Commission. The position pays about $120,000 per year, plus benefits, according to the state’s “open checkbook” website. The veteran lawmaker cruised through confirmation hearings before the Legislature’s energy committee and the Senate. Lawmakers did not inquire into Hobbins’ November 2016 citation for operating under the influence in Amesbury, Massachusetts, which he disclosed in his nomination papers. Hobbins wrote to lawmakers that he “would welcome the opportunity to discuss this matter more fully and to provide additional information.” The citation will be dismissed after he completes a driver alcohol education program he’s scheduled to complete on June 5, 2017, according to his nomination packet. “I wanted this in plain sight, and I’m glad it was,” Hobbins wrote in an email following the Senate’s 31-0 confirmation vote. Hobbins had returned to private law practice since losing a primary contest to Sen. Justin Chenette of Saco, who was a House Representative at the time. Chenette also testified in support of Hobbins’ public advocate nomination Tuesday. Hobbins will replace Tim Schneider, who LePage appointed to the position in 2013 out of private practice at the Portland law firm Pierce Atwood. Hobbins wrote that he will start the new position during the second week of June.